When the Spanish conquistadors claimed areas of Central America and Mexico in the sixteenth century, they discovered the ruins of a great civilization, that of the Mayans, who had vanished and left evidence of their lost grandeur in massive structures that had been over-whelmed by the surrounding rain forest. The native people could not explain the significance of the sprawling, vacant cities to the conquistadors. Unlike the great Incan cities, the Mayan centers had long been abandoned. The ruins of the Mayans did not begin to reveal their secrets for 300 years. 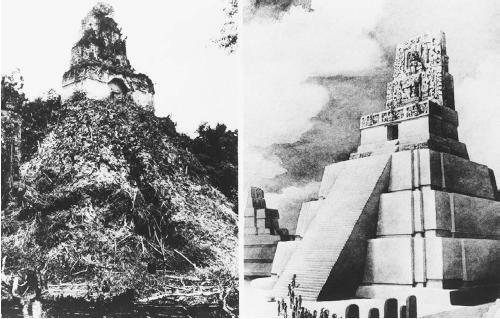 Since the nineteenth century, enough information has been gathered about the Mayan structures to sketch a history of their development, but the reasons why the great structures were suddenly abandoned, and the exact purposes of the massive and elaborate buildings, continue to remain trapped in the past. The Mayan empire stretched south from the present-day Mexican states of Veracruz, Yucatán, Campeche, Tabasco, and Chiapas to almost all of Guatemala and parts of Belize and Honduras. Ruins in the Guatemalan highlands include Copán, a typical Mayan center with plazas, pyramids, a court for ball games, and blocks of stone inscribed with hieroglyphics. Tikal, another Mayan center in Guatemala, had more than 3,000 structures in a six-square-mile area. Vast palaces with hundreds of rooms, rows and rows of wooden huts, and increasingly larger buildings approaching the center of Tikal accommodated a surrounding community that may have numbered as many as 90,000 people. Palenque is among the centers in the middle area of the Mayan region, where the rain forest is thickest. Among the finds there is the Temple of Inscriptions, a 65-foot-high pyramid. A secret passageway was found by archaeologists in 1952 that led to an elaborate tomb. Riches of jade, finely carved, life sized statues, and an elaborately sculpted sarcophagus were discovered. When modern archaeologists finally mastered Mayan hiero-glyphics in the 1970s, inscriptions on the wall of the temple were deciphered. They identified the corpse as Sun Lord Pacal and described his life. Tracing references of dates with the Mayan calendar, another example of Mayan achievement, archaeologists were able to determine that Sun Lord Pacal was born in 603, ascended to the throne in 614, and died in 683. The 69 steps that run up the front of the temple each represent a year of his reign. The Yucatan peninsula along the Gulf of Mexico forms the northernmost region of Mayan settlement. Among the ruins there are Chichen Itza, which feature a collection of pyramids, temples, and other common Mayan structures as well as an observatory where the movements of the Sun and Moon and the planets Mars, Venus, and Jupiter were charted. Further inland lies Uxmal, site of two temple pyramids, a complex of four buildings around a courtyard, and the Palace of Governors with magnificent terraces and a stone mosaic frieze more than 300 feet long (a mosaic consists of small, inlaid materials of various colors that form a pattern or a picture, and a frieze is a richly ornamented band or line on a building). The various ruins were not excavated and examined until the latter half of the nineteenth century. They show that Mayans developed systems of mathematics, writing, and astronomy and erected monumental forms of architecture. Subsequent discoveries showed their calendar recorded dates as far back as 600 B.C.E. By the first century B.C.E., they specifically used a calendar that had 18 20-day months—matching the Mayan base-20 mathematical system (the contemporary mathematical system used in the West is base-10). Because of the state of decline in which the conquistadors found Native Americans of the region, and fueled by cultural bias that made Europeans skeptical that less-advanced people could create such monumental structures, many early explorers believed that the engineering feats of the Mayans had been directed by peoples from the eastern Mediterranean region. Phoenicians and Egyptians had been seafaring people in ancient times. Perhaps they had sailed across the Atlantic Ocean. Those who believed such theories speculated that the Mediterranean seafarers had directed the Mayans to build pyramids, taught them hiero-glyphics, and brought them social order. Variations on the theme of an external influence on the ancient Mayans continued to develop. Instead of Egyptians or Phoenicians, however, it was advanced Asians who first reached the Mayans and taught them secrets of architecture and mathematics, written language and astronomy. Or perhaps inhabitants of the legendary continent of Atlantis spread their knowledge to various peoples of the world, including the Mayans. Excavations helped clarify some of the mysteries involving the Mayans. They had distinctive cultural traits evident in similarities of architecture—including pyramids, terraces, and ball courts—and artistic styles of paintings and pottery spread throughout their empire. When modern archaeologists learned how to read Mayan hieroglyphics by establishing meanings and patterns in the images, a history emerged that showed the Mayan centers were not occupied by peaceful astronomers and the large structures did not serve specifically as ceremonial sites. Instead, the hieroglyphics boasted of the accomplishments of a war-like elite. Many of the great Mayan buildings were monuments to great military leaders. Settlements with large structures served as centers for trade, but primarily for the accumulation of riches for the elite of Mayan society. Those who contributed to culture, artisans and astronomers among them, were highly esteemed, but a ruling elite held the riches and the power. The Mayans learned to grow maize, beans, squash, and cacao. They raised cotton and developed a textile industry for spinning, dyeing, and weaving cloth, but they did not develop metal tools, domesticate large beasts of burden, and, in spite of building an elaborate system of roads, did not develop the wheel. Over the centuries, the Mayans domesticated the dog and the turkey, and they discovered how to mine copper, gold, silver, and jade, creating valuable and prized items. circa 400 B.C.E. to 250 C.E. had evolved into terraced, pyramidal shapes. The Mayan pyramids differ from those in Egypt, where the sides of the structures converge to form a pointed top. The pyramidal structures of the Mayans reach a certain height, then level off to form a flat platform on which temples were built. Mayan civilization thrived until around 800 when a decline began. Tikal was abandoned, and the process of recording events stopped there by 900. Building began in another center, Seibal, in the southern low-lands in 830 but ended abruptly around 900. Uxmal showed more development around 850, but it was abandoned around 925. Chichen Itza was abandoned around 987. It was subsequently occupied, like some of the other centers, but new massive structures were not built and the old temples did not serve the same functions as they had in the past. In 2000, near the present-day village of Cancuen, Guatemala, a Mayan palace was discovered in a long-abandoned city named the Place of Serpents that is estimated to cover an area as large as two football fields. With 170 high-ceiling rooms and 11 courtyards, the palace was revealed to have been a prosperous center of commerce and crafts. Inscriptions on the palace walls showed that it was completed by a leader named Tah ak Chaan, who ruled over Cancuen from 740 to around 790. Unlike other Mayan centers, there are as yet no indications that the rulers of the area engaged in warfare. There are no pyramids in the area, or outdoor plazas, and there appears to be a complete absence of religious symbols or any indications of the ceremonies evident in other Mayan centers. Rulers of the city appeared to specialize in commerce, not warfare, and a larger working-class group of people seemed to live in the Place of Serpents than at other Mayan centers. Hundreds of workshops where artisans plied their crafts were found. What factors caused the demise of the Mayan empire remains a mystery. Destruction from earthquakes is evident in some Mayan centers, but not all, and earthquakes are not believed to have leveled any of the major centers. There is no evidence of mass burials that would indicate an epidemic, such as plague, small pox, or other infectious diseases that swept through Europe during the same time as the Mayan's golden era and downfall. An isolated disruption caused by conquerors from the north, a natural catastrophe, or war among leaders of Mayan centers would have affected trade routes that ran through the interior. Tikal, a major inland center dependent on trade, would certainly have been affected by such a disruption. Twice, in the sixth and ninth centuries, Tikal seems to have undergone some form of chaos. The great success of the Mayan culture may be a plausible reason for their downfall. As the population grew, the stress on agriculture became greater, for an expanding population requires consistently more food production. Soil erosion or drought would have greatly affected the large settlements. A decrease in production would have led to malnutrition, increasing the likeliness of disease. Some human skeletal remains from the period show signs of malnutrition, but no conclusive evidence has been found to determine a sudden, widespread catastrophe. Strange as it may seem, the Mayan calendar may have played an influential role in the culture's decline. The calendar was used for prophecy, as well as marking the date. The Mayan calendar begins with a date relative to 3114 B.C.E., when, according to the Mayans, the world began and the first Great Cycle got underway. Thirteen future cycles were recognized, and bad things often happened at the end of such cycles. For example, one cycle ended during the 500s, at about the same time that the city of Tikal went into decline. Another decline occurred in Tikal 256 years later, also at the end of a Great Cycle, and the city was all but abandoned. Whatever happened to the Mayans was an event of such magnitude that it caused a fracture in the long-standing practices and social order of the entire culture. The great cities continued to be occupied for decades after the hieroglyphics stopped reporting triumphs, and then the majestic temples, stately pyramids, and massive edifices were abandoned completely to the surrounding jungle. Whether or not the unknown dire events were prophesied or became self-fulfilling prophecies by the belief of a superstitious people accepting their fate is not known. According to Mayan prophecy, the end of the most current Great Cycle —2012— will end with a cataclysmic flood. Deuel, Leo. Conquistadors without Swords: Archaeolo gists in the Americas. New York: St. Martin's Press, 1967. ———. Flights into Yesterday: The Story of Aerial Pho tography. New York: St. Martin's Press, 1969. Very Interesting and great article. So informative. I'm wondering since there is hardly any mention of large graves and skeletal remains, might there be a chance of some natural disaster sweeping the Mayans away. I've always thought that the temples were built on pyrmids or heights to keep out flood waters etc... This is just my opinion. What caused the temples to be underground? were the mayans already gone before the spaniards came? i think that every 2500yrs or so there is a comet, kind of like haley comet, but, this comet comes much closer to the earth and is what caused the extinction of the mayans and the eqyptions and the dinosaurs and so on and so on.. The Mayans believed the the world has been destroyed 3 times and created 4 and that the 5th time to be recreated is in 2012. All of the prophysies point towards that date.. 12/21/2012 We will see. If so... GOD bless everyone!